What’s It Like to Dive with Sharks? For most people, diving with sharks is the ultimate underwater adventure. If you’re planning on visiting Deep Sea World soon, then you must consider taking a shark-dive with us – it’s a thrill of a lifetime! But if you’re not quite ready to dive with sharks yet, or you’re just curious to find out what the experience entails, read on, because we’re sharing what it’s actually like to dive with sharks. Shark-diving is the perfect activity for thrillseekers and nature enthusiasts. Our diving team is highly experienced, so you can dive assured that you’re in safe hands. Visitors come to dive with us every single day, so you have nothing to be scared of if you decide to dive with the Deep Sea World sharks. Simply dive in (both literally and figuratively speaking) and let the excitement and heart-pounding experience sink in as you come face-to-face with a shiver of sharks, where there’s virtually nothing separating you from the big fish. 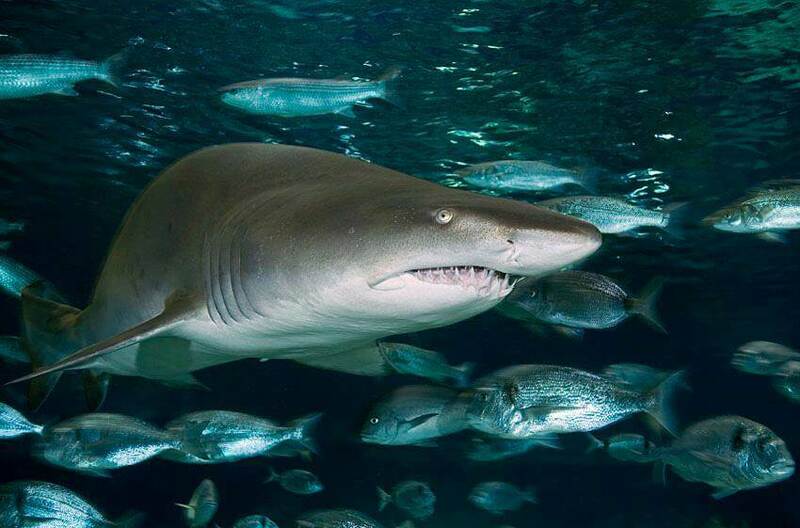 Although diving with sharks may seem like a scary prospect to some , there are many species of docile sharks – including our sand tiger sharks and angel sharks – which are particularly suitable tank-mates for new divers. After experiencing a shark-dive with us, you’ll learn that with a little encouragement and preparation, you too can push through your fears and do something you’ve always dreamed of doing but never had the courage to! Diving with sharks is one of the most exciting ways to learn more about them. It’s a once-in-a-lifetime opportunity that can promote better understanding of these majestic marine creatures. That’s why, in addition to seeing our sharks up-close, our knowledgeable dive team will teach you more about what you can do to help protect shark species and habitats. So if you’re looking for an experience that’s as educational as it is entertaining, one of our shark-dive packages would make the perfect addition to any visit, and would give you a unique experience that you can cherish for years to come. If nothing else, diving with sharks will allow you to see these magnificent, beautiful creatures up-close and personal – and since everything looks about half their actual size through the tunnel glass, you can’t fully grasp the majesty of these big fish until you’ve been graced by their presence in the same tank. Whether you’re a qualified diver or a complete newbie to diving, participating in one of our shark-dives is the best way to truly admire and appreciate their beauty. Diving with sharks is an amazing, unique experience. No matter what level of swimming expertise you are, you can swim with sharks here at Deep Sea World. In fact, we offer a range of shark-dives for any level and any age, including children aged 8 to 15 years old. So don’t feel limited by your abilities – if you want to dive with sharks, but aren’t a great swimmer, you can find a shark-dive experience that suits your ability. To find out more information, give us a call on 01383 411 880 or contact us.